Parts: 1. 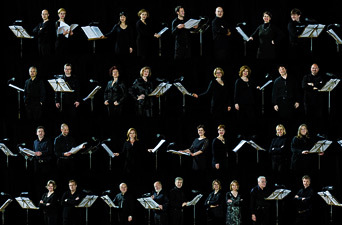 HOCH STEHT AUF TIEF for coloratura soprano, lyric soprano, adult’s choir, flute/s, synthesizer/celeta, harp, string orchestra, bell trio, taiko trio and percussion ensemble. 2. TAG DER WAHRHEIT for coloratura soprano, lyric soprano, mixed adult’s choir, children’s choir, philharmonic orchestra, wind orchestra and percussion ensemble. 3. WAHRHEIT IST for coloratura soprano, lyric soprano, organ solo, violin solo, mixed adult’s choir, children’s choir, philharmonic orchestra, wind ensemble, percussion ensemble, taiko trio, tombek sextet and electronics. 5. FALL DER KREUZBLUME for coloratura soprano, lyric soprano, mezzo-soprano, tenor, bass, two mixed adult choirs, children’s choir, philharmonic orchestra, wind orchestra, cathedral’s workshop ensemble, taiko ensemble, percussion ensemble and electronics. 6. WIND DES FRÜHLINGS for pop singer, electric bass, choir, philharmonic orchestra, brass ensemble and percussion. 7. LEBENDE STEINE for coloratura soprano, lyric soprano, mezzo-soprano, bass, two mixed adult choirs, children’s choir, wind orchestra, philharmonic orchestra, two percussion ensembles and electronics. 8. 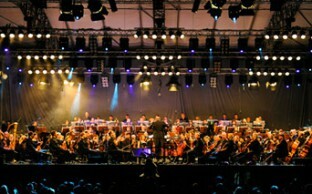 HOCH UND TIEF VERKEHREN EINANDER for coloratura soprano, lyric soprano, mezzo-soprano, teno, bass, violin solo, organ, kyeboard instruments, two mixed adult choirs, children’s choir, philharmonic orchestra, wind orchestra, two percussion ensembles, taiko ensemble, bell orchestra and electronics. Instrumentation: for ten soloists, philharmonic orchestra, brass orchestra, children’s/youth choir, mixed adult choir, bell orchestra, construction workshop ensemble, eleven percussionists in several formations, electronics and sound reinforcement system. Text: “Ulmer Oratorium – Eine Turmfantasie” (A Tower Phantasy) by Robert Kleindienst (in German). 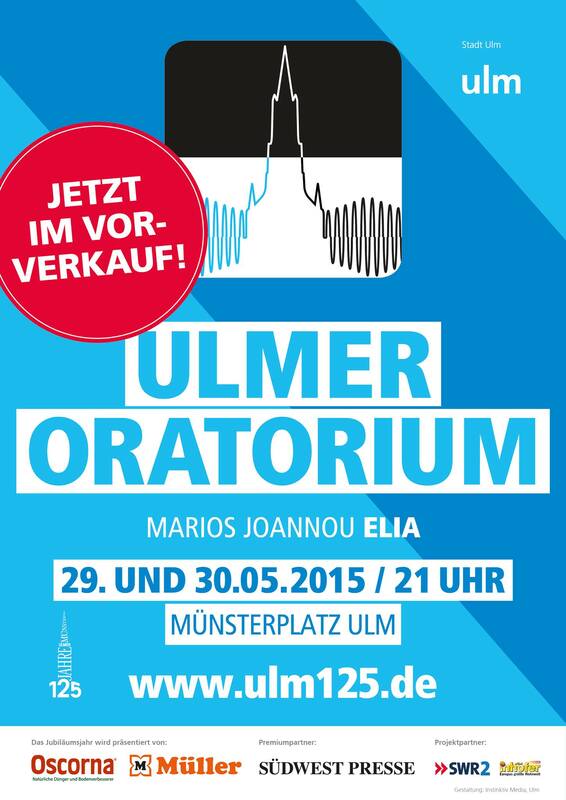 Commission: City of Ulm for the 125th Anniversary of the Ulm Minster Tower. Parts: I. OVERTURE for percussion nonet (octet plus timpani), symphony orchestra, choir and electronics. II. GENESIS for 14 solo automobiles, automobile orchestra in 3 groups, 120 automobile players (120 percussionists), symphony orchestra, choir, percussion octet and electronics. III. 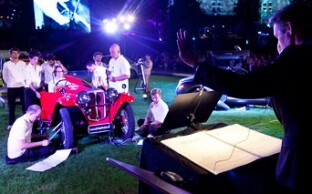 MAN AND MACHINE for choir, symphony orchestra, automobile orchestra in 2 groups, 120 automobile players percussion octet and electronics. IV. 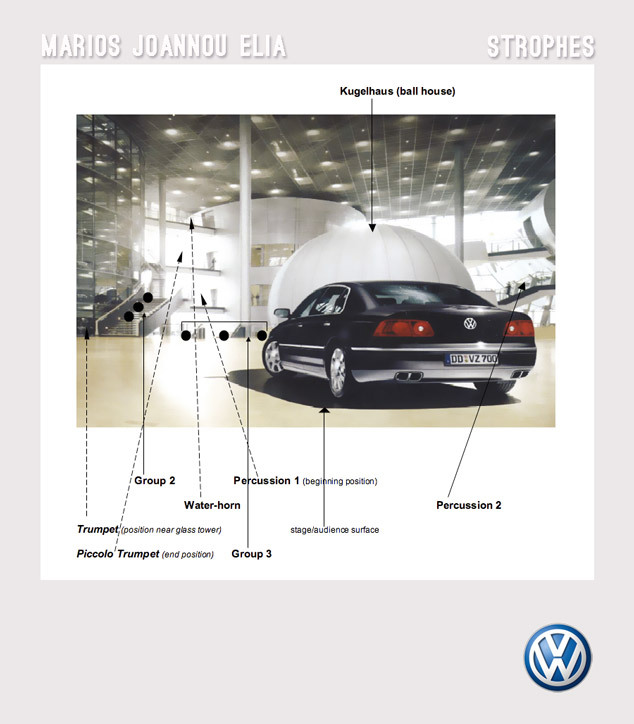 THE DREAM (THE AUTOMOBILE) for pop band vocal ensemble, symphony orchestra, choir and percussion quintet (Text by Xavier Naidoo and Metaphysics). V. FORM FOLLOWS FUNCTION Autoquartet – for 4 automobiles, 14 automobile players and electronics. VII. ON THE ROAD for children’s/youth choir (Text: “Im Auto über Land” by Erich Kästner). VIII. 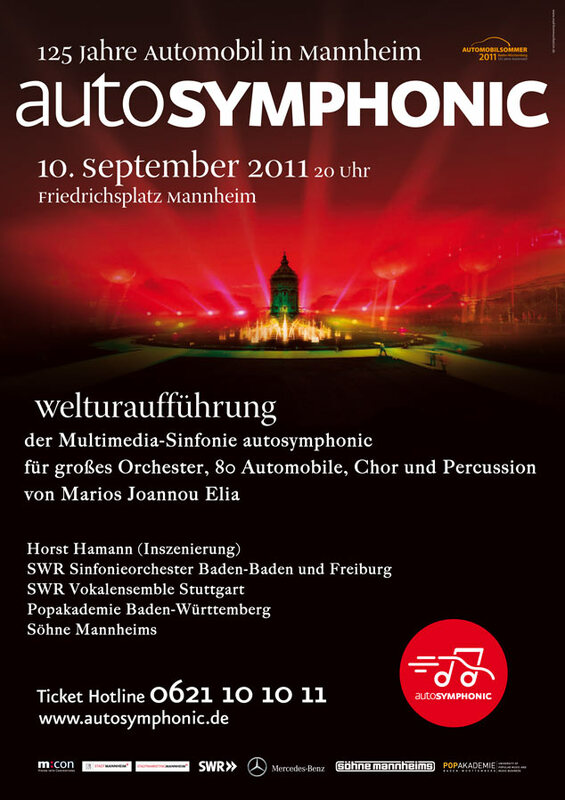 VIRTUAL REALITY for 14 solo automobiles, automobile orchestra in 4 groups, 120 automobile players, symphony orchestra, choir, percussion octet and electronics. IX. FINALE for 12 solo automobiles, automobile orchestra in 9 groups, 120 automobile players, symphony orchestra, choir, children’s choir, pop band vocal ensemble, percussion octet and electronics. For Concert Halls: Version for symphony orchestra, choir, 80 pre-recorded cars and electronics (see Orchestra category). SWR Baden-Baden and Freiburg Symphony Orchestra, SWR Vocal Ensemble Stuttgart, Stuttgart State Opera Children’s Chorus, Söhne Mannheims, Pop Academy Baden-Württemberg, 120 adolescents from the City of Mannheim. 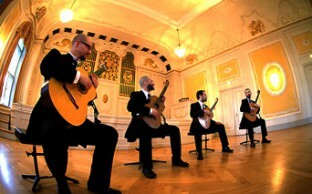 Premiere: New Year’s Reception of Mannheim’s Mayor, Rosengarten Mozart Hall, Mannheim (January 6, 2011). Pop Academy Baden-Württemberg, National Theatre Mannheim (cond. Harald Braun). Benz Patent-Motorcar, Aero 6218R, Audi R8 Spyder (Mercedes-Benz E-Class Cabriolet). Note on Orchestra Type: Oversized marimba played by rubber balls shot from a robotic cannon and a series of spinning wineglasses dampened by robotic fingers. 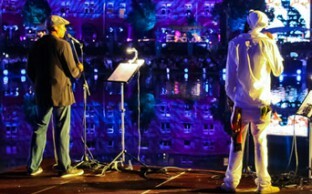 Premiere: Ars Electronica Linz, Linz 09 European Capital of Cultural (July 16, 2009). 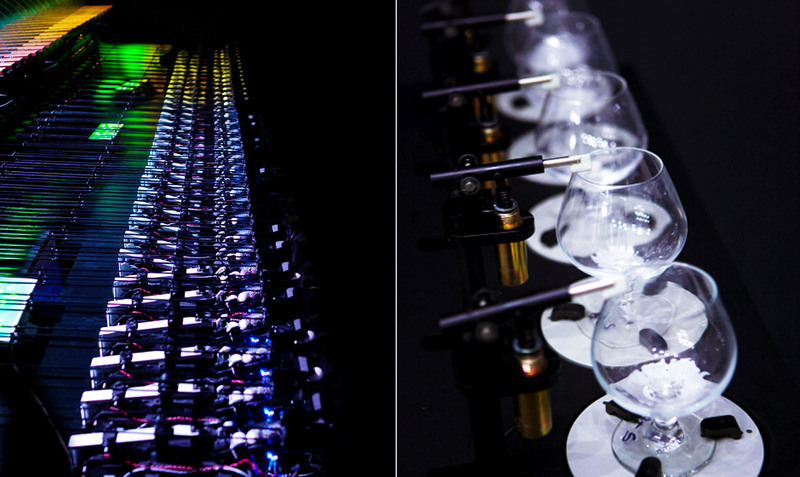 Absolute Machines – Absolute Quartet by Jeff Lieberman and Dan Paluska (Massachusetts Institute of Technology). 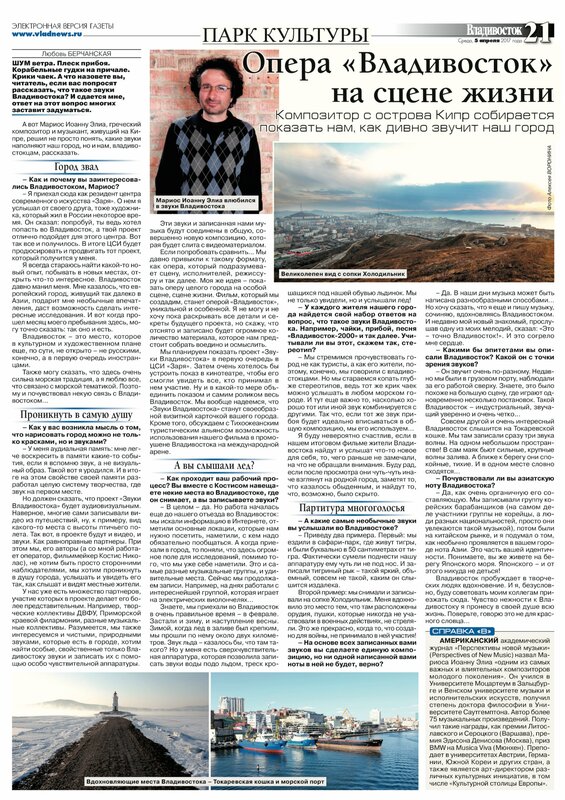 Commission: International Association for Polyaesthetic Education in Homage to Wolfgang Roscher (25 Years IGPE). 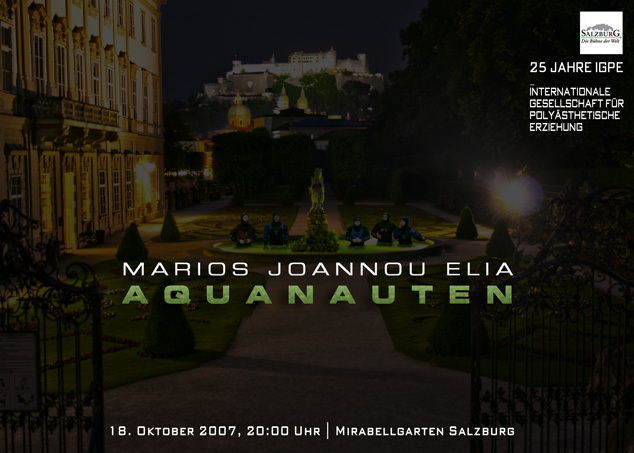 Premiere: Mirabell Palace Garden, Salzburg (October 18, 2007). 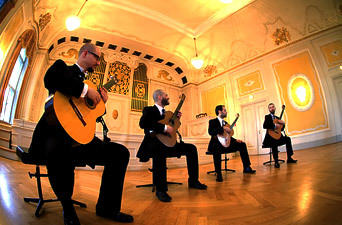 Premiere: Plenarsaal of the Akademie der Künste, Berlin (December 1, 2007). Kammerensemble Neue Musik Berlin, Contrabass clarinet: Theo Nabicht, Double bass: Arnulf Ballhorn, Electronic sound wave generator: Nick Elia, Technical realisation and sound projection: Georg Morawietz, E-Studio AdK Berlin. 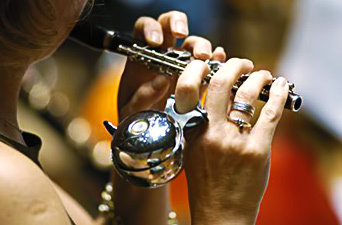 Instrumentation: Saxophone, clarinet, flute, piano / synthesizer, violin, viola, double bass, percussion (2). Commission: HELLERAU – European Center for the Arts. 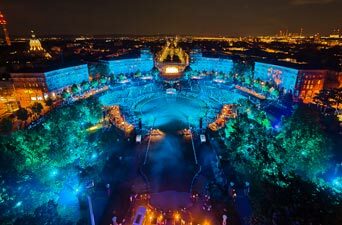 EZKM Ensemble Dresden, Conductor: Ajtony Csaba, Sound projection: Hendrik Manook, Scenery: Rebecca Ringst, Video and staging: Beate Baron. Instrumentation: Boy soprano, soprano (3), alto (2), tenor (2), bass (3). 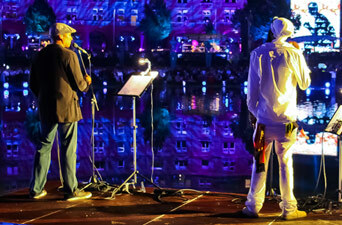 Trumpet, tenor trombone, water horn, percussion (2), harp, conductor, assistant (actor / percussionist), sound director (2). Car, elevator, glass tower, various sound equipment. Note on Performance Site: The work is also performable in a concert hall. Text: Ordinary of the Tridentine Mass, “Always for the First Time” by André Breton, “Médieuses”, “La Terre est Bleu” and “Premièrement” by Paul Eluard (English, French, German, Latin). Commission: The Volkswagen Transparent Factory, International Forum for Culture and Economy in Dresden. 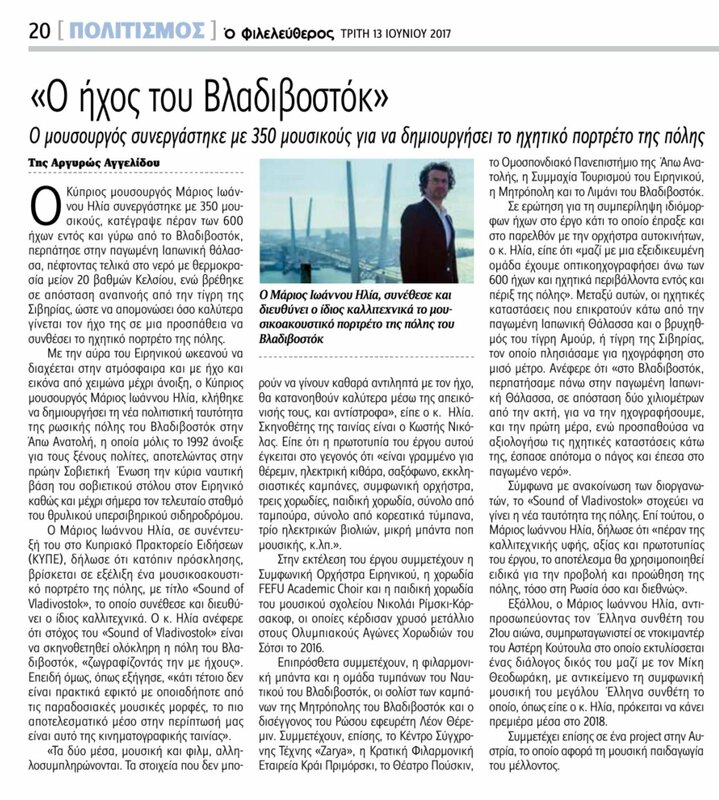 Text: “Chronogram” by Marios Joannou Elia (in English). 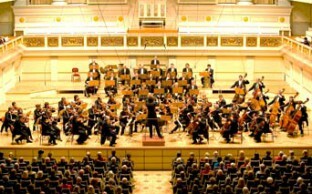 Premiere: House of the Mozarteum Orchestra, Salzburg (May 25, 2004). Premiere in spatial modus: Salzburg Easter Festival (April 20, 2006). 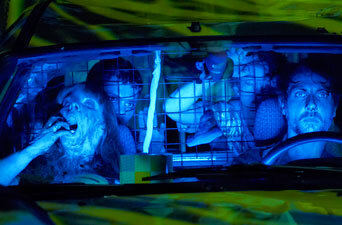 ARGEkultur Salzburg, Video: Christoph Kendlbacher, Spatial sound projection: Marios Joannou Elia. Note on Instrumentation: A version with narrator (live performance) is available. Text: Sappho (in Ancient Greek). Premiere: Carl Orff Institute’s Theatre Hall, Salzburg (November 30, 2001). Narrator: Babette Slezak, Video: Christoph Kendlbacher, Spatial sound projection: Marios Joannou Elia.